“For the rhythm of life is a powerful beat, puts a tingle in your fingers and a tingle in your feet”. Everyone loves a good musical number. One that has the ability to make your toes tap in-time to the beat and leave you humming all the way home. 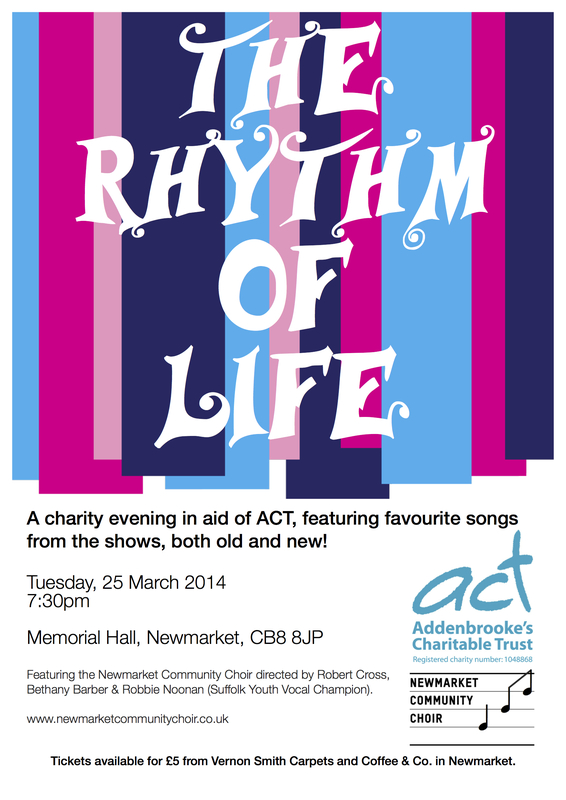 The Newmarket Community Choir will be featured in this concert entitled “The Rhythm Of Life”; an evening of song from the shows at the Memorial Hall. Featuring popular pieces from Rent, The Lion King, Mary Poppins, Company, Into The Woods, Once, AvenueQ, Les Misérables and more! Tickets are still available for this performance which will also see solos and duets from Newmarket Community Choir director, Robert Cross, local performer and vocal coach Bethany Barber and Robbie Noonan – Suffolk Youth Vocal Champion. Tickets are £5 and you can get them from Vernon Smith Carpets and Coffee & Co. in Newmarket. It will be a great night and will put you in a great mood for the rest of the week!